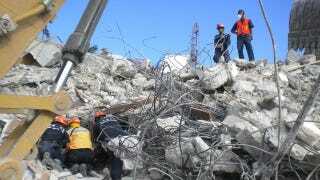 Trapped under rubble, unable to move following a natural disaster, it would be easy to assume the worst. But soon the Wi-Fi hotspot on your phone may be able to help raise alarm—acting as an SOS beacon to guide rescuers your way. At least, that's if Amro Al-Akkad, an engineer with the Fraunhofer Institute for Applied Information Technology in St Augustin, Germany, has his way.New Scientist reports that, inspired by cheeky Wi-Fi names near his apartment—like "no smoking on the balcony" and "turn the noise down"—he realised that an app could insert a short SOS message into the name of a phone's Wi-Fi hotspot, too. In collaboration with emergency workers, Al-Akkad and his team have developed "victim" and "seeker" apps which allow the one to locate the other. New Scientist explains that the app allows a victim to write a 27-character message—such as "need help fire on 4th floor"—and a seeker app can spot it from 100 meters away. It's already been successfully used in disaster simulations in Norway.